Late one night, Wilbur hears a tapping at his window. There, standing in the yard outside his window, is a baby apatosaur. Knowing that the dinosaur can't stay, Wilbur begins the long journey back through time to take him home.Bravely facing a fierce saber-toothed cat and narrowly escaping a monstrousTyrannosaurus rex,the two new friends trudge through the Ice Age and past the Cretaceous period, finally arriving at the Jurassic period. 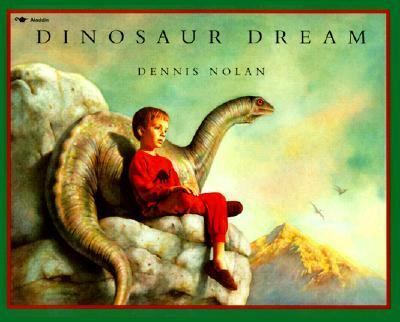 Once his long-necked friend is safely home, Wilbur makes the journey forward to his own time atop the largest, most spectacular dinosaur he's ever seen.Nolan, Dennis is the author of 'Dinosaur Dream' with ISBN 9780689718328 and ISBN 0689718322.